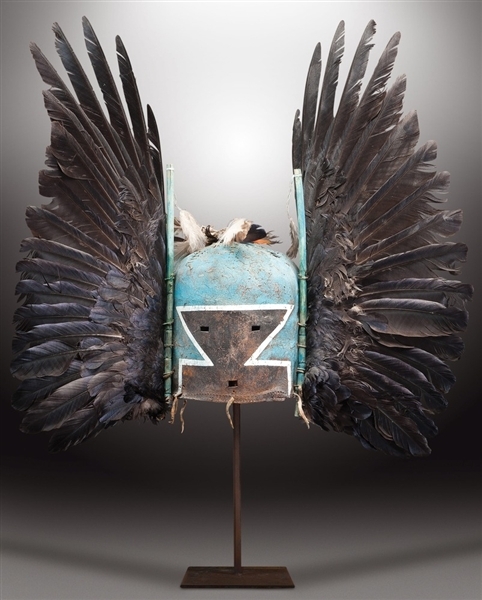 a mask entitled ‘Angwusnasomtaqa’ or ‘Tumas Crow Mother’ as part of the ‘Katsinam Masks’ auction sale at Drouot-Richelieu. Monroe Warshaw got caught up in the auction of Hopi Katsinam masks that became controversial last April when the tribe tried to stop the sale. The art dealer and photographer ended up buying two of the lots for $34,000. After the auction Warshaw spoke to reporters, expressing his views. He said he felt vilified by the media and has received a lot of hate mail in response to his comments and purchases. With some trepidation, he recently decided to go to the Hopi reservation, planning to give one headdress to the tribe and the other to a museum. But after attending a Hopi home dance, Warshaw had a change of heart. The Hopi call them friends or spirits. At least two other friends from the auction have been returned to the tribe. But Warshaw said another Paris auction of similar items is planned for the fall.